Today is Black Friday, supposedly when we all go out to Wal-Mart at 6:00am and try to buy discount merchandise for the holidays. When Chinese made products are made for $.50 cents a day, 50% off at Wal-mart is just a smaller mark-up from the actual cost. Some would rather try and drone out the repetitive holiday music that is already infiltrating our air space and consider today to be buy nothing day. I think a less radical version could be, "Buy local day." Try to limit yourself to buying gifts from local businesses and supporting people who can put money back into the neighborhood. Box stores offer little to local employees and leave little room for advancement besides staying at close to minimum wage jobs. You could also treat a friend or loved one to a little education this holiday season and illustrate some of the points I am trying to make by purchasing the new Wal Mart movie by investigative documentary film maker, Robert Greenwald wal mart movie Robert took on Fox news and exposed it for what it is and does the same with America's number one employer which luckily we have been able to keep out of the 5 borough area. 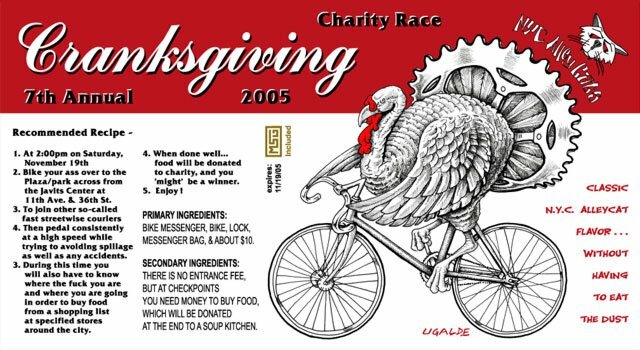 Cranksgiving Flyer by exceptional artist Greg Ugalde. Cranksgiving. 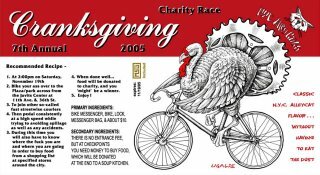 Pictures for the event are now found on the NYBMA website cranksgiving page For those who don't know, this is an event to gather food for those less fortunate and have a fun alley cat in the process. 55 racers made the 7th annual Cranksgiving charity race the largest Cranksgiving ever. We raced from the Javits Center up to Gristede's grocery stores on 96th & 3rd, down to Battery Park, and back to the Javits center. Over 200 items of stuffing, potatoes, cranberry sauce, and canned soup were donated to St. Mary's food Pantry at 440 Grand St.
Bike Blog took a little break. Give up your Car, if You're a millionaire.